These interviews, given during the life of St. Josemaria Escriva, explain the nature of Opus Dei and describe some basic aspects of its spirit and organization. The replies of Opus Dei's founder, despite the awkwardness of the inadequate juridical terminology at the time, explain its aim to spread in all spheres of society a deep awareness of the universal call to holiness and apostolate, in the fulfillment of one's ordinary professional work. 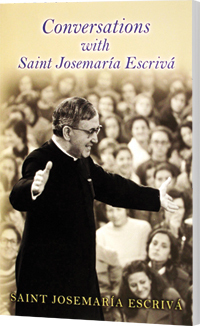 St. Josemaria also addressed issues of family life, education, society, and the Church. The freedom of the individual, his love of the Church, and his own supernatural outlook and human warmth are features that permeate these conversations.